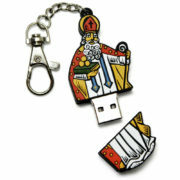 Saint Nicholas, in colorful and durable PVC, houses an 8GB flash drive and comes with a handy clip so you can bring this saint with you wherever you go. 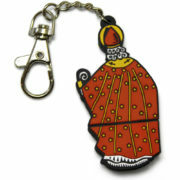 Saint Nicholas was a 4th century bishop in the ancient Greek town of Myra. He was good and charitable, always looking for ways to help the poor. Once he heard of a man who had lost all of his money and didn’t have dowries to allow his three daughters to marry. Because of his poverty they would have been sold into slavery. Saint Nicholas went at night and secretly tossed three bags of money into the man’s house through an open window. 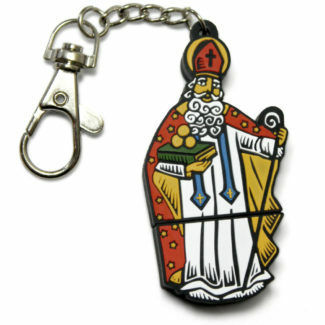 Tradition says that the money landed in the family’s shoes, giving rise to the practice of filling children’s shoes with treats on December 6th, the feast day of Saint Nicholas. Santa Clause is a commercialized and secularized adaptation of this holy saint. Saint Michael, in colorful and durable PVC, houses a 16GB flash drive and comes with a handy clip so you can bring this saint with you wherever you go.